Great public speakers know that the clock isn’t their enemy; it’s their friend. Keep a wrist or pocket watch on the podium or somewhere easy-to-spot, as its presence will ensure that you won’t have to rush at any point during your speech. Most people hate the sound of their own voices or the way they look on camera, but if you want to become a better speaker, it’s time to get out the video camera (or at least the tape recorder.) 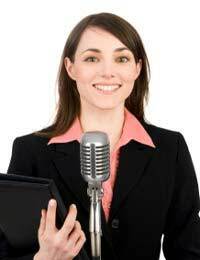 Record yourself giving a 15-20 minute speech and then play it back. Watch and listen for times when your energy is waning and the flow seems “off”. The more often you do this, the more comfortable you will become with keeping a steady tone and cadence, even if you have to give an unexpected speech. As you’re writing your speech, evaluate every aspect of it for necessity. Though some information may seem relevant to you at first glance, ask yourself if listeners honestly need to know what you are dying to tell them. And if the answer is “no”, take out that piece of the presentation. When your speech is free of fluff, it will have a much better flow. Having a point should be the main goal of every speech writer; but it doesn’t always happen that way. Some writers and speakers can be quite sloppy, and the flow of their presentations reflect their inability to boil a speech down to its elementary essence. As you’re writing your speech, do as you did in #4 above – ask the tough questions of yourself and be prepared to jettison anything that doesn’t belong. Even if you’re not “sold” on your topic, have a passion for it when presenting. (Or at least learn how to act like you do.) Otherwise, finding and sustaining a natural flow will be nearly impossible and listeners will not be engaged in the experience, as they’ll immediately sense that you’re uninspired. Finally, it’s vital to know what you’re talking about, even if that means you have to research and study for tens of hours before writing and giving your speech. Let’s face facts – if you don’t have a clue as to your topic, it will be difficult to have a rhythm when discussing it in front of a crowd. Do your homework, and you’ll be ready for anything during your speech. I am wanting to use my story as an inspiration for other people. I love public speaking and have someone coaching me. My problem is I have making my speech flow naturally. I am a member of Toastmasters in Australia and have given a number of speeches. They have improved as I progressed through the Projects in the Manual I am using. I had a problem with time but I finally overcame that. Now I am having a problem with the flow of my speech. I will practice the above seven steps and see how I go. I would love to become like Les Brown.